I hope that everyone had a great weekend. 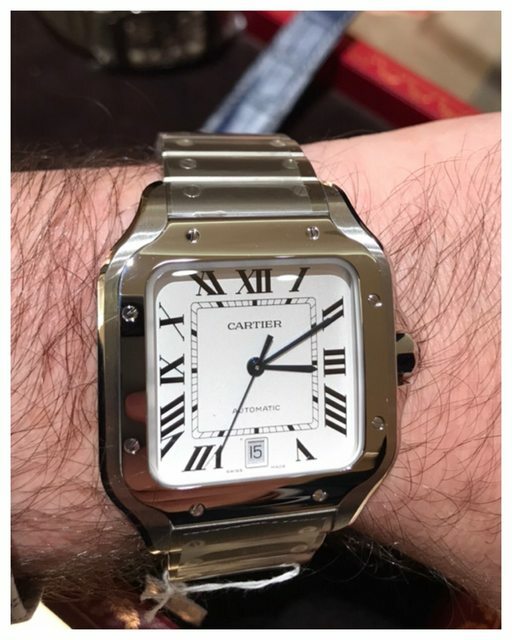 I did a little traveling and was lucky enough to be in a city with a Cartier AD and an authorized dealer, where I was able to view some of the relatively new offerings from the Santos collection. 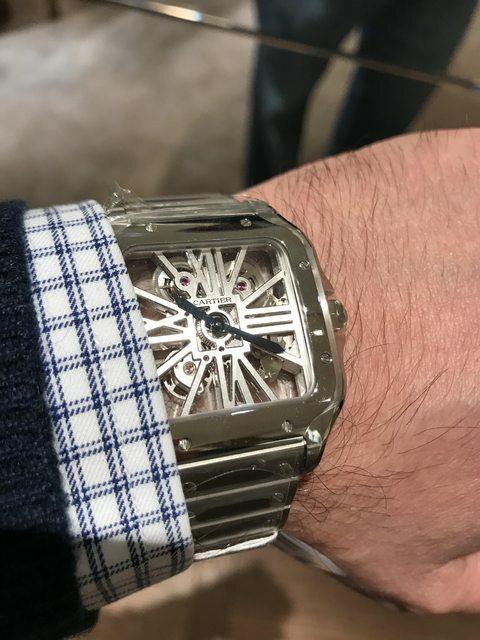 As many of you know these watches use in-house caliber 1847 MC, and have the familiar screw motif that has been found on previous Santos models, but with a newly revised bezel. 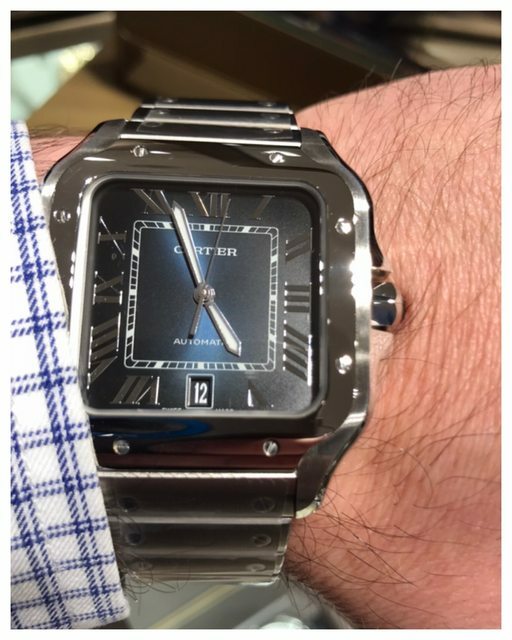 The previous bezel was basically a rounded square, which left a bit of case metal visible between the bezel and the bracelet. 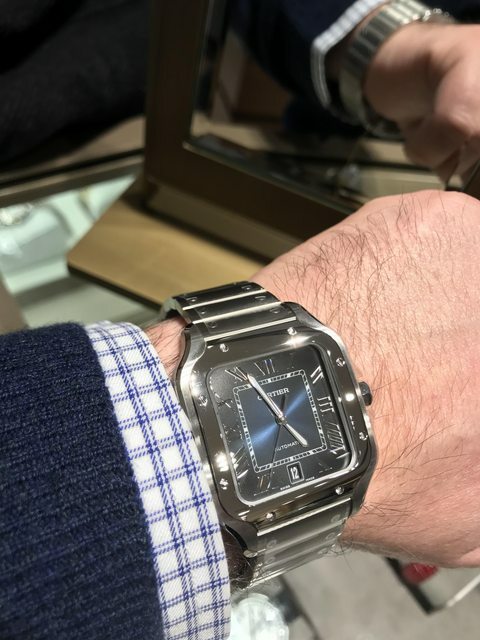 While the top and bottom of the revised bezel now flow toward the bracelet attachment points, leaving no case metal visible to separate the bezel and the bracelet, creating a more integrated appearance. It takes a bit of getting used to the change, but once wearing it for a while it looks like it was always intended to look that way. 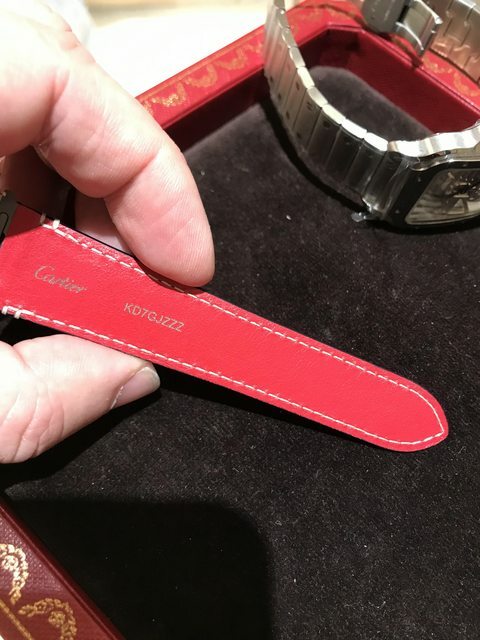 The new watches also use the "Quickswitch" system, which allows the wearer to easily change between a metal bracelet and a strap (both of which are included with these watches). Here is the white/silver dial on a bracelet. 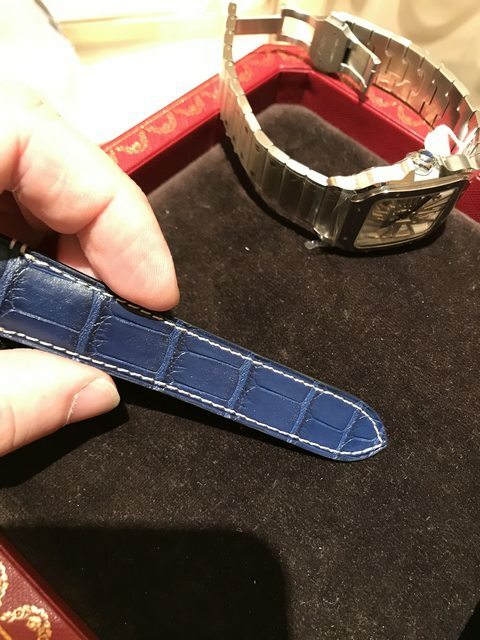 The strap was created for this boutique's grand re-opening and is dark blue on the top side and red on the bottom. This skeleton piece is a real stunner! It uses caliber 9611 MC, which has a 72 hour power reserve. The case is the same size and thickness as those of its large automatic siblings and it is also water resistant to 100 meters. This could be a great watch for James Bond! It's dressier than his previous Submariner or Seamaster, so it would look great on his wrist as he enters the Casino de Monte Carlo wearing a tuxedo, and it would look just as at home on his wrist as he dives into the ocean to chase villains. 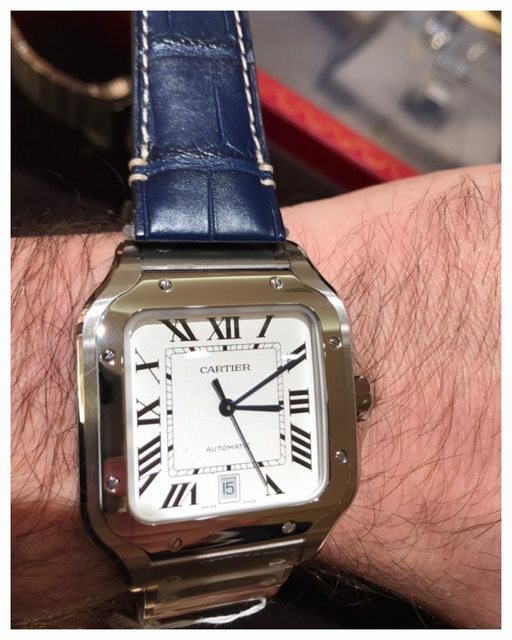 Finally, the recently released blue dial Santos De Cartier. Again, I really liked all of these watches and they were a real pleasure view and wear. I hope to add one to my collection soon. Amazing post and beautiful photos. The blue sings like a canary to me! Just love the way you described the blue-grey-black play of light and shade. secondly the colour should be darker, to match the dial. Still, this is one on the list, no doubt. The Blue Dial Santos is really a handsome watch. As mentioned, one has to try it on and see it in person to really appreciate it. Well, if you don't care for the standard strap you can always buy one of their alligator straps, and keep the original strap as a spare.